My Q&A with author, guru and super-nice guy Steve Strauss ran in last week's special small business section of The Miami Herald. Unfortunately, it could soon disappear into the ether, so I've posted it here along with short reviews of the first edition of his Small Business Bible and an earlier book, The Business Start Up Kit. Please visit his website for more Steve Strauss goodness. Q: How should small businesses deal with the current economic state of affairs in terms of marketing, advertising, personnel, customers, vendors, financing, expansion, insurance? A: The biggest and most common mistake small businesses make during times like these is that they cut back in the areas that are actually needed the most right now — marketing and advertising. Here's why: Customers are volatile; loyalty is something that most people abandon when what they really want are discounts and value for their dollar. The result of that is two-fold: First, you will lose customers; we all will. Second, there are plenty of new customers out there to be had as habits change. BUT, the only way they will find their way to your door is through your advertising and marketing. It is shortsighted to cut back in those areas. That said, belt-tightening is smart. For example, if you can legally turn an employee into an independent contractor, do so. That can save plenty on costly labor expenses. Keeping overhead low in ways that don't hurt customer acquisition is key. The other smart thing to do is to focus on customer service. Use the 80-20 rule to figure out who your most vital 20 percent is and lavish those valuable customers with added value. That is the name of the game right now — added value. Q: Can the Internet help companies survive the downturn? A: The Internet is critical to survival. Aside from the fact that it is where everything is headed anyway, the power on the Net in this economy is that it is so inexpensive to use, yet so powerful. For instance, you could spend $1,000 on a print or media ad that you hope the right people will see or hear and maybe act on. That same $1,000 spent on a pay-per-click campaign will yield far more targeted leads — people who saw your ad, liked it and already took action by clicking. Search Engine Optimization is equally important. More and more people are abandoning Yellow Pages and other traditional ad forms in favor of Google searches. You have to make it easy for them to find you, and you do that through SEO. I recently saw a stat that over 50 percent of all small businesses still don't have a website. That is shocking! You simply must have one. If for no other reason than websites are increasingly where people go to determine if they want to hire you or buy from you. By the same token, make sure you get a good one. The Net is the great equalizer. Any small business site could, and should, look every bit as good as that of any big business. Finally, these days it is inexpensive and quick to get a beautiful, elegant, professional site. A: I love this Paul Harvey quote: ''In times like these, it helps to recall that there have always been times like these.'' It felt like the economic sky was falling when the dot-com bubble burst, and also after 9/11. We made it through then and we will again. Is this worse? Of course! But it is survivable. People are looking for bargains. Give them what they want. Q: What's something that most companies neglect to do when things get rough, but shouldn't? A: Too many companies fail to see opportunities during rough times because they are so focused on survival. And while it's important to keep your eye on the ball, it is a mistake to lose sight of other possibilities. For example, recessions are great times to innovate. The cost of goods and labor is less, and you and/or your staff probably have some extra time on your hands. Use that time to come up with new ideas and try them out now. Recessions are also good times to see what fat can be trimmed. Find a cheaper supplier, or less expensive insurance. But it's also important not to think the only way to increase demand is to cut price. Price cuts aren't the only way to stimulate demand, and they aren't the best approach for entrepreneurs. On average, entrepreneurs are more successful when they compete on service, quality or something other than price. So price cutting in a recession is often a losing strategy for entrepreneurs. What's a small business? It could be a single store in a strip shopping center, an individual freelance artist, a couple selling used computer parts on eBay from their home, a journeyman plumber, a 10-person catering company — in other words, almost anything where money changes hands for goods and/or services. The "small" is just a matter of size, not intention. In fact, it's often just a way of describing the beginning of the adventure. After all, great oaks begin as tiny acorns. Many people — employed or unemployed — may want to start their own enterprises but don't have a clue where to begin. Others may have already begun but are either flying blind or without a net. In either case, some guidance and direction might be useful. Mentoring might help, but it's difficult to determine the quality of the advice. Fortunately, a few books are available to aid neophyte entrepreneurs. 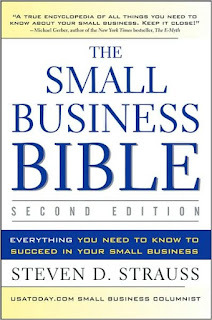 The Small Business Bible: Everything You Need to Know to Succeed in Your Small Business. Steven D. Strauss. John Wiley & Sons. 526 pages. If you're going to refer to your text as a Bible, then you'd better have your act together. I'm pleased to report that Strauss does. He's the small business columnist for USA Today, which is no guarantee, but he also authored The Business Start Up Kit, so he knows his stuff. One of the first things that rookies discover is that when one is self-employed, it's necessary to become an expert on virtually everything, from finance, human resources, legal issues, administration, advertising, marketing, sales, technology and more, in addition to developing expertise in the company's specialty. Strauss lays out a panoply of pertinent information in a clear and logical manner. He covers a lot of ground but manages to make it all seem practical and unthreatening; no mean feat, considering the amount of potential obstacles that inexperienced entrepreneurs face. Strauss employs a number of checklists, as you might expect, and also wisely includes referrals to other sources of information. The result is a solid primer for beginners and those who've yet to experience the full array of ups and downs that small businesses offer. The Business Start Up Kit: Everything You Need to Know About Starting and Growing Your Own Business. Steven Strauss. Dearborn Trade Publishing. 304 pages. One potential route to riches begins with starting one's own business. 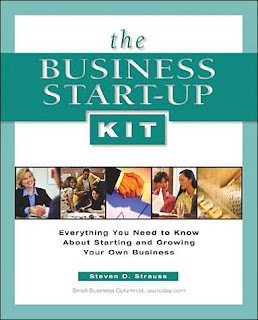 Strauss, whose last book, The Big Idea, explored how certain innovative products and services were brought to market, has cooked up a do-it-yourself guide and workbook for start-ups. It's a multidisciplinary challenge, and Strauss proves to be up to the task. His book offers advice on names, locations, franchising, production, distribution, licensing, financing, advertising and so forth. The author turns out to be a good hand holder. And while much of what he offers may be obvious to some readers, there's enough that will likely be new to others to make this book a sort of Swiss army knife for would-be entrepreneurs.